Windows 8.1, just like Windows 8, ships with Windows Media Player by default. The program has been crippled by Microsoft as it does not play DVD movies anymore. You may remember that it did play them on Windows 7. So, if you want DVD playback on Windows 8.x, you need Windows Media Center or a third party alternative. As part of the Windows 8 promotion, Microsoft has given away Windows Media Center keys for free to interested users. It is interesting to note that you did not have to own a Windows 8 license to snag a key, and that each customer could get up to five Media Center keys for free in that period. Depending on whether you have upgraded Windows 8 to Windows 8.1, from a previous Microsoft operating system, or did a clean install, you may not have access to Media Center right away. The easiest way to find out if you have it installed is to enter Media Center on the start screen of the operating system. If you see Windows Media Center listed in the results, it is installed on your system. If you do not see it, it needs to be added first. It is actually not that difficult to install Media Center. It works best if you already have a key though. 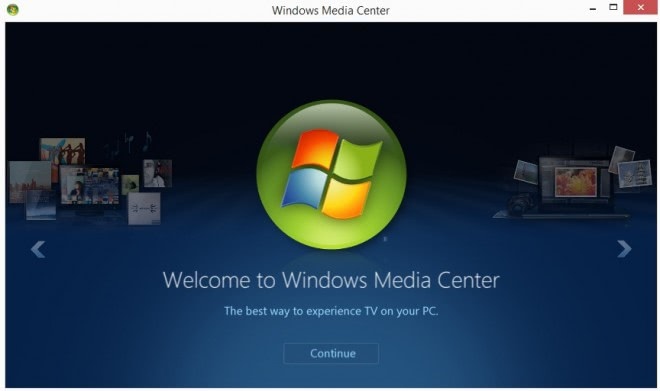 You can purchase Media Center for $9.99 provided that you are running Windows 8.1 Pro already. If you are running the regular version of Windows 8 instead, you need to purchase the Pro upgrade for $99.99 first before you can add Media Center as well. Windows RT users are out of luck, Media Center is not available for their operating system. Type features on the Windows 8.1 start screen and select the "Add features to Windows 8.1" entry from the results. 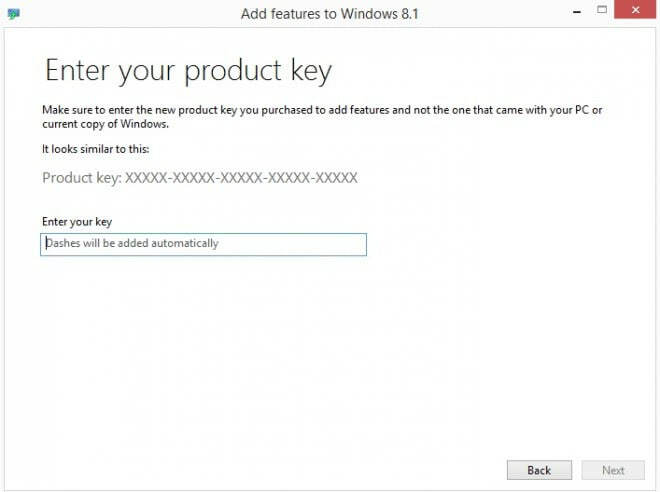 If you already have a Media Center product key, select "I already have a product key" from the window that opens up on the desktop. 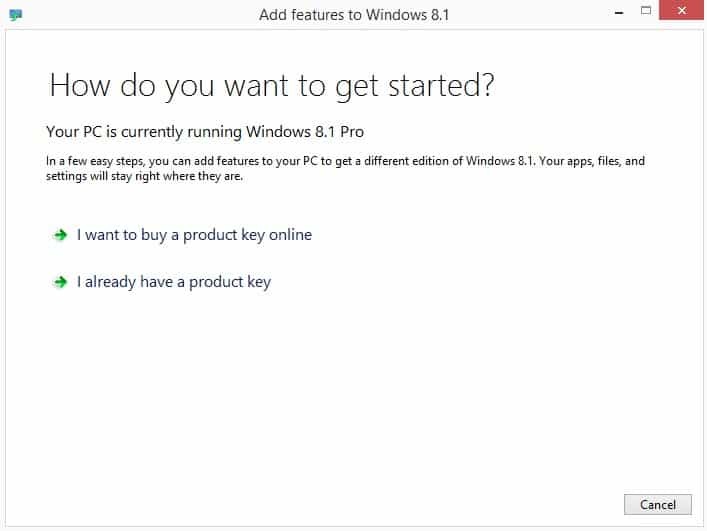 If you need a key, select "I want to buy a product key online" instead and follow the instructions. Enter the product key on the next page and wait for it to be verified. The computer will restart if everything turned out to be alright and Windows Media Center will be installed in the process. If you already have a product key for Media Center, it is a no-brainer to add the program to the Windows 8.1 operating system. That may also be the case if you are a die-hard fan of it, or have used it extensively on your previous system. Is it worth the extra $10 if you have to purchase it? That depends on what you want to use it for. If you just want to play DVDs - Blu-Rays are not supported - then you may want to try free alternatives like VLC Media Player instead for that instead to see if it fits the bill. I’d be quite happy to have Media Centre if it was simply bundled. But it certainly isn’t so much better than the opposition that I’d jump through hoops to get it, let alone fork out serious money. Strikes me MS are just lost in rigmarole these days, with little idea of the priorities of their customer base. The most essential thing here is of course what was mentioned only very briefly: by far the most users have a regular Win8 edition, not the required Pro version. So the average user has to pay not $10, but $110 for the privilege of installing WMC. Who in his right mind would pay that much? This means that if you have Win7 and you use WMC for watching TV (like I do), the Microsoft marketeers in their infinite wisdom have given us one more reason to stick with Win7 instead of “upgrading” to Win8. Do they really not understand that asking $110 extra, just for keeping a Media Center that we already have up and running today, is not exactly a convincing offer? It looks more like an intentional barrier to keep Win7 users away from Win8. This is so stupid, there most be some supersmart reasoning hidden behind it. I just don’t get it. This does not work for me. When I try to buy the product key online, it says that ‘sorry, online purchase is’nt available in your region.’ WTF? This is after upgrading to Windows 8.1 Pro. I’m getting that same error message. My region is the U.S.
No features are available to purchase yet – check again after the official launch date to add media centre. I’m also getting the region error, what now. Dreamspark.com has free Windows 8.1 pro keys for students whose schools have a partnership with M$. I just got mine pho freeee. Also they have a bunch of other M$ products all free to students. I have windows 8.1 I got through Dreamspark and it wont accept the product key to add media center to my pc. ie in step 1 there is no “Add features to Windows 8.1” entry in the results. There are only links to a page on a microsoft site telling you how to do the same thing as found above. i have a key, says its valid then comes back after spinning its wheels saying to use a different key.. i want media center on my surface pro 2! I have a key and I did pay €9.99 for it. I tried to install but after saying it is a valid key it comes back saying that I must try a different key. I had the same issue. It had in fact installed, and I eventually noticed that above the system tray on the desktop it said that I had windows 8.1 with Media Center. Media Center should be in your list of all apps. My issue was that the installation screwed windows by deactivating it. The only way I could get out of this was to roll back to the restore point before Media Center was installed. I now need to find out how to install Media Center without deactivating 8.1 Pro. When I search for features I do NOT get the option to “Add features to Windows 8.1” but I definitely have windows 8.1 Pro N. What to do? Anthony try following the steps in my website where I posted about this issue. Bearing in mind that the price difference between microsoft home premium and profesional version oe is only about £40.00, how come microsoft want £ 100.00 to upgrade from the home version before media player can be added . Looks like a rip-off to me. I purchased and installed Windows 8.1 Pro with the Media Center. Now my apps do not work. I have tried many things to fix this problem. I am about ready to uninstall 8.1 and start over. Frustrated!